This post contains affiliate links. I only recommend products that I use and love myself, if you chose to purchase products linked in this post, I will receive a small commission which helps to keep the blog going. Thank you! I see you girl, you are tired, worn down and just feel like you are constantly pouring into everyone and everything. 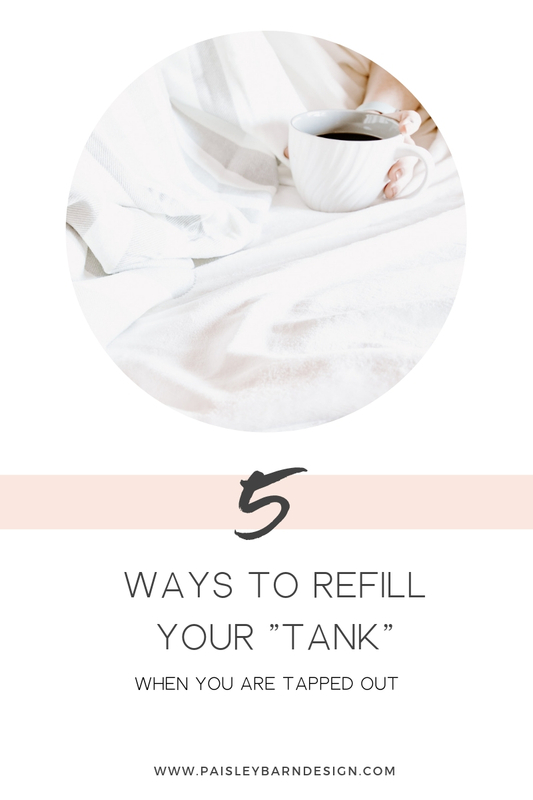 Everyone is always talking about self care and how important it is to refill your tank, right? But that will take energy to do it, energy you just can’t muster up. Maybe you have little ones, or your work load is so high that it’s all you can do to drag yourself through the day to get it done. The house is trashed and you just want a fairy godmother to appear and do all the things for you. It’s ok. I’ve been there. Here is what I have found to get me through. I do my best to get in some time everyday, it’s not at 5am every morning before the kids get up, it’s not always before I get into the busy-ness of the day, it’s not even while I’m quietly and leisurely drinking my hot morning coffee ( we all know coffee is best served cold 3 hours later) but even if it’s a quick, stolen moment from the day, this is when I feel safe, validated, filled up. If you need somewhere to start I HIGHLY recommend “Embraced: 100 Devotions to Know God is Holding You Close”, by Lysa TerKeurst this has been the best devotional book I have purchased. It seems like every day that I open it up, it’s speaking directly to where I am at and the scripture it exactly what I need. Drink some water. Seriously. Water is your life line. When I’m feeling blah, worn down or just cranky, I drink some water. Sometimes it’s just the taking a break to drink the water that is helpful. You will always find my Yeti close by, no matter where I am at. It’s a habit that I have created to keep it full and close and it’s made a difference! Eventhough I would love to think that I was sinking into a gorgeous clawfoot tub surrounded by subway-tiled walls with only the most stylish products, alas, that is not my bathroom. You can always turn off the lights and imagine it, right?? Grab a few essential oils and epsom salts to make it even more relaxing and therapeutic. Wait until after the kids are in bed and fast asleep and close your eyes and just take some time to be still, soak up the quiet and recharge. Did you read that right? I didn’t say “Shut Down” but shut it all down. What do I mean? The devices, the screens, the noise of social media, text messages…. chances are that is adding to the stress and the whole draining of everything you have to give to the world. Leave the phone plugged into the kitchen at night, get up and walk around every 30 minutes or so if you work at the computer. I know what you are thinking… I have SO much to do! I can’t take a break every 30 minutes! I feel ya girl. I’ve been there, in fact I go back there over and over. But here is what I KNOW. When I take breaks, when I walk around, when I take time to spend with my kids, take care of a few household chores…. I feel better and I am able to give more productive time to the work I’m trying to accomplish. That’s what I do friends. It’s a struggle, it may even be a life long struggle. For me, I find myself going back and forth. It’s about establishing new habits. It takes time. When you slip back into your old ways, it’s ok. You are doing great, know that these things come in seasons and it will change.